We’ve passed the half-way point and have 3-5 weeks remaining this season, all depending on how the crops grow… and when this baby (who we’ve lovingly named Baby Corncob) decides to make their arrival. We’re hoping Baby Corncob holds off until closer to the end of the CSA season, but we shall see! We are excited to send the very first of the winter squash out to you this week! The harvest was much smaller than in years’ past, as the plants battled insects and the viral damage they bring. We will only have a few to give you over the next few weeks, but we are glad that we have some for you. Radish—French Breakfast. This french heirloom variety is so lovely, it’s our favorite variety. Asian spring mix—this is a bag of tender salad greens that packs a lot of flavor in many beautiful textures and colors. The mix includes a few types of mustard, mizuna, tatsoi, and a few other Asian greens. Winter Squash—Large shares received all of this year’s harvest of spaghetti squash, and small shares received the full harvest of butternut squash. Just a few small shares received a pumpkin when we ran out of butternut. (We always hope to have several weeks of every type, but it didn’t work out that way this year!) Spaghetti squash should be cut in half lengthwise, seeds scooped out, rubbed down with olive oil, salt, and pepper, and then baked upside down on a sheet pan for about 40 minutes at 375, then fluff with a fork and serve like spaghetti. Butternuts need to be peeled (which won’t be super easy with the tiny ones), and then roasted. This is one of our favorite types of squash. Savor these tiny beauties! Arugula—this fresh, young, tender cutting of arugula is really high quality this week. I hope you enjoy it! Kale—everyone received another bunch of our kale. We’ve got a great recipe for rainbow kale salad that would be great with roasted sweet potatoes. Turnips— Hakurei Japanese turnips. These are a fresh-eating salad turnip. Even if you think you’re not a turnip fan, give it a try! I can chow down on one of these like an apple, but it’s even better sliced with salt and lemon. Feel free to prepare with onion, garlic, and butter, like more traditional turnips, or use them raw for salads and snacking. Mixed Onions—This is the final week of onions! We gathered up everything we had left and divvied them all up. Enjoy the last of the onion harvest. Sweet potatoes—Another share of this great fall staple. If you haven’t made sweet potato soup yet this year, our best recipe is the one you should try. Winter squash, onions, and sweet potatoes will prefer to stay at room temp. Everything else will keep longest stored in the fridge sealed up in a bag. 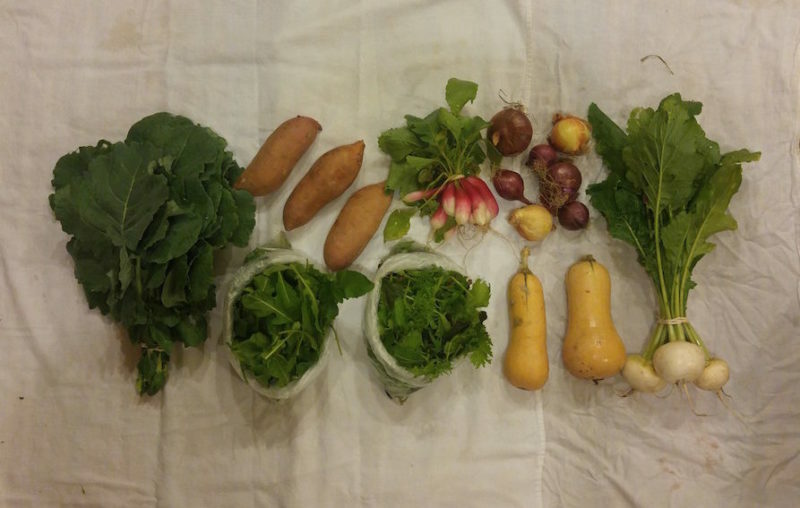 All root crops should be severed from their tops to keep the roots from getting rubbery. Everything will need a gentle washing before cooking, but leave the dirt on until you’re ready to use them to prevent spoilage. 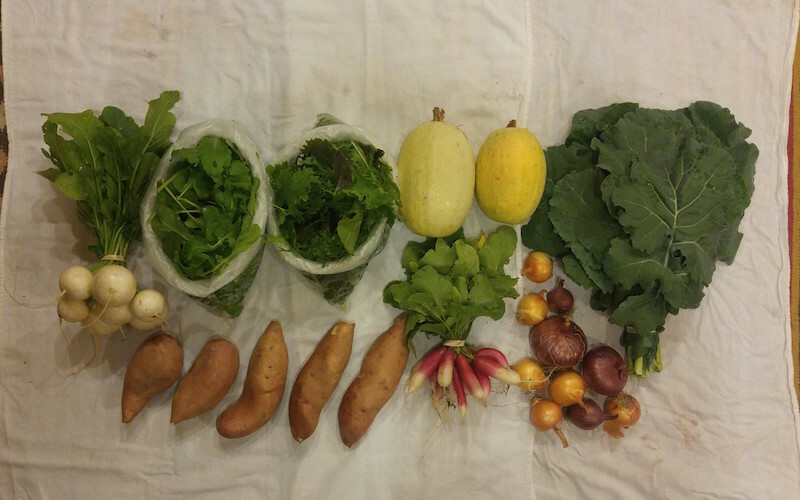 Large Share: (top left to right) Turnip, arugula, Asian spring mix, spaghetti squash, and kale. 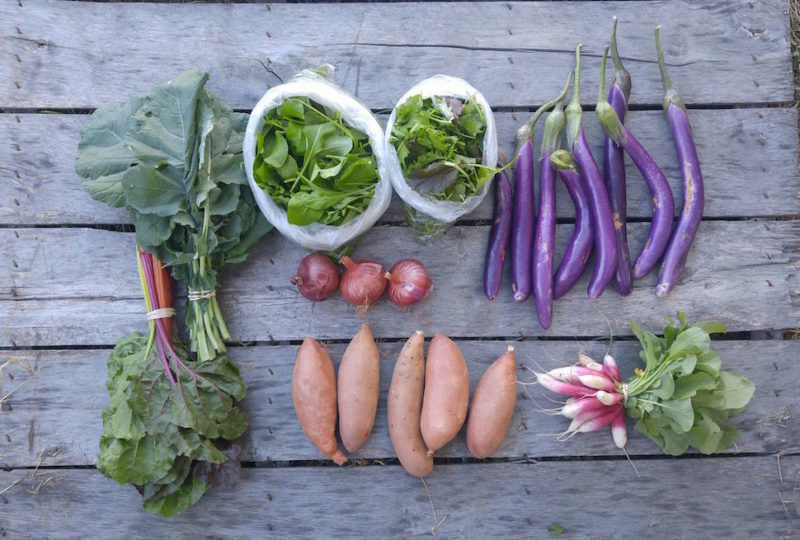 (bottom) sweet potatoes, radishes, and mixed small onions. ← The Farm Family is GROWING!